We are a Category 1 Provider in New Zealand, which means NZQA are highly confident in our educational performance and capability in self-assessment. Massage is a growing industry that can offer you a fulfilling career or give you the freedom to run your own business, your way. 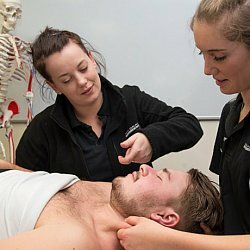 Our graduates work in physiotherapy clinics, hotels and spa resorts, cruise ships, hospitals, gym complexes and much more! Contact us and discover how we can help you gain in-depth training that can lead you into this incredibly rewarding Industry.